Sorry for the delay. I have either been running around like crazy or exhausted, no in between, LOL. Well, I’m here in Atlanta but before I can tell you about that (which will have to wait until next week, I’m pooped) I want to tell you about the rest of my trip in Holland. Bookie, Nes and I were thinking about doing one of those pictures where you dress up in costume and take a picture but we were debating. JK said we should just go for it. Thank goodness for JK! We had an absolute blast. They let us take pics during the whole process which a lot of times they don’t so that was even better. 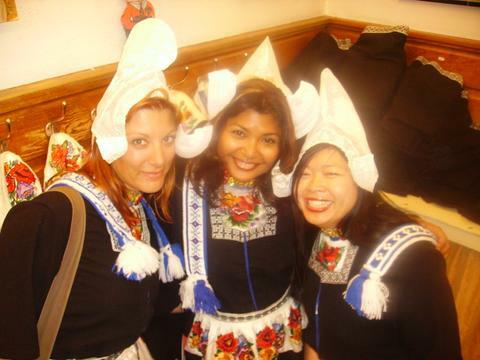 We were wearing old style traditional dutch outfits which means we were dressed in wool skirts! They were the frumpiest things I have ever seen. I tried to lower it to my waist to try and give me a figure that wasn’t round shaped but then it was too long and wouldn’t show off my shoes so I had to wear them above the belly. Then it was time to put the shirt on, the bib, a necklace and of course, the lace hat! 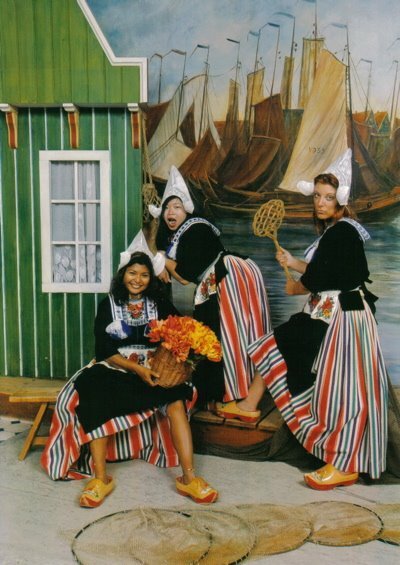 We were tradional dutch women, we would give humpty dumpty a run for his money! They asked us what background we wanted, the fireplace of the docks. Want to guess which one we picked? We decided that we were dockside whores, LOL. The ladies who worked there were unflappable. Next thing you know they’re posing us, handing Bookie a paddle to spank me with, I’m bent over and Nes is sitting there with a basket of flowers, although it was pointed out to me she wasn’t so sweet with her legs spread, LOL. It is the most hilarious thing ever because we also had facial expressions to match. JK documented the whole thing but the best pic by far was the one we posed for. Here is the infamous picture. I love it so much! The funny thing is the outfit is so heavy and hot that when we took it off, I felt nekkid in my jean skirt and blouse, LOL. 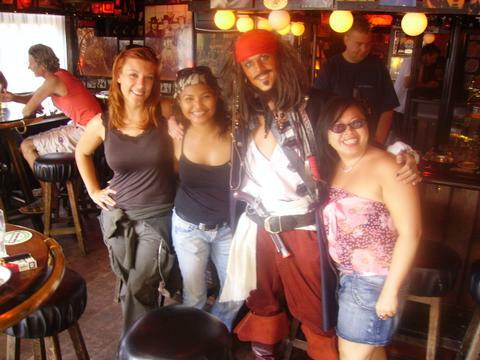 After our exhausting photo session we went to a local bar to have a final drink before Bookie had to catch her train and who should appear but Jack Sparrow? I swear, you never know who you’re going to run into in the Netherlands! Soon I will work on my Ode to the Netherlands but I had a most fantastic summer there. When I’m slaving away at Burger King working on paying off this trip I will think it was worth it. I hope that you have enjoyed my travels with me and I will come back prolly on Mon to share my Atlanta adventures with you. Sorry to make you wait so long but I really want to go to sleep and I won’t be on a puter til Mon. ← Cramming it all in…. Do you honestly think you can pop that comment on Jack Sparrow in there and we won’t notice,that you could just leave it at that? HELL NO!!! Spill,was it Depp himself or a lookalike,what?He does live in France,doesn’t he,so I guess a little trip north could happen. Don’t be a tease,Leiha! *G* I’m glad you got to spend time with Bookie,and I can’t wait to see this pic,it sounds like a scream. I cant wait to see the pictures, first you impersinate a dutch whore and then Janita Low? Who will you be next? LOL, sorry Bo, I tried to post the pic so it wasn’t meant to be a tease. There was a guy impersonating Capt Jack walking around so of course we had to get a picture with him *G*. I thought I was handling jet lag ok but considering I can’t stay awake past 11:30pm I guess not. I don’t get a choice tonight, it’s the weekend and I’m with the gals so who knows when I will get to bed. Who says I was IMPERSONATING a dutch whore?